Guide to Employee Recognition for TODAY! 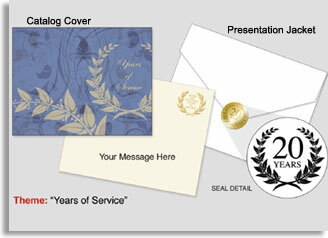 Let your employees choose their own work anniversary gift from tier-level awards (catalogs and online), given to them in a personalized service award presentation packet. Read about work anniversary gift ideas below. Corporate Anniversary Employee Service Gifts provide powerful opportunities to acknowledge and reward loyal service. Service recognition can have a significant impact on employees, by building morale and encouraging continued loyalty to your company. Award Presentations: For the most impact, present the service award in front of the employee's peers. These presentations offer great opportunities for managers to praise the employee's long service and specific achievements, while demonstrating your company's appreciation for its people. Work anniversary gifts are one of the most popular recognition programs you can provide for employees.Most companies recognize workplace anniversary gifts by the year, starting with the 5th anniversary of service, with an incrementally larger award every 5 years thereafter (5, 10, 15, 20, etc). Many companies are also providing recognition awards for on-boarding programs, and at 3 months, 1-year and 3 years of service, resulting in improved employee morale. Budget ideas for Service Milestones: Many organizations spend between $10-$25 (and more) for each year of service. Using that example, a five year work anniversary gift would be budgeted at $50 and $125 (or more). However, what you allocate for each milestone will depend on many factors and your budget for the employment anniversary gift. Select-Your-Gift's easy to start and administer program provides fast personal assistance, customized award presentation packets, no minimum order quantities, and workplace anniversary gifts are backed by our 100% satisfaction guarantee. Each Employee Service Gift includes an Award Presentation Packet, award certificate stationary and packet-closing milestone-seal, a gift of choice catalog, the selected company anniversary gift, and the gift shipped (within the lower 48 US). The employee anniversary gift includes everything need for your service award presentation. Many customization options are offered, and award catalogs are available in 17 price levels, to fit every budget. See full Details..
plus we'll send a sample Award Presentation packet and catalogs.